You wouldn’t immediately assume your musical preferences and your drive to keep track of money in order to maximize freedom could be related to some underlying brain chemistry. However, according to the controversial Empathizing-Systemizing Theory, they very well could be. I personally believe the FI community is heavily composed of adept systemizers (even though I don’t agree with everything about the E-S Theory), so this merging of unlikely subject matter is meant to be fun and hypothetical while providing some thought-provoking connections. To start, I’d like to provide a summary of one of my favorite academic articles about music and mental health. Then I’d like to connect this content to money (since this blog largely focuses on the psychology of systemizing and the special mental health needs of those who are extreme systemizers). This peer-reviewed article begins by discussing how biological brain differences can lead to different preferences in music. 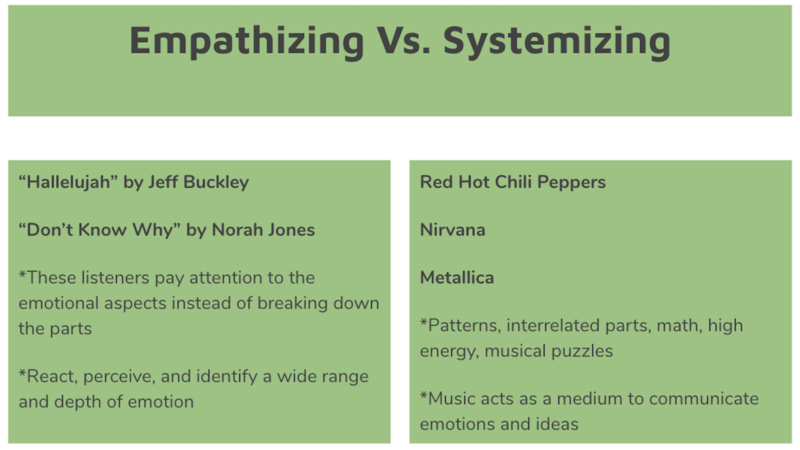 The researchers theorized that differences regarding empathizing and sympathizing lead people to have different favorite artists and conducted a qualitative study. In this study, people with autistic traits (those with sensory sensitivities, obsessive interests, and a literal-based cognitive style) were especially interviewed about their take on melodies, rhythms, favorite composers, etc. As predicted, different empathizing and systemizing quotients in various individuals largely determined their musical preferences. Songs like “Hallelujah” by Jeff Buckley and “Don’t Know Why” by Norah Jones were associated with empathizing while The Red Hot Chili Peppers and Nirvana were associated with systemizing. This data aligns quite well with my personal experience (and fascination with the lead guitarist John Frusciante from the RHCP in my early 20s). How Can This Information Help People? The researchers used the results reported by the people in the study to show how music and empathy are connected in unexpected ways in high-systemizing populations. For example, the study found people with autistic traits first listen to music because of its systemizing aspects; for example, patterns, inter-related parts, and the math present in music theory. Then these individuals use the music to relate to aspects of themselves for emotional reasons; helping them self-reflect in a way not possible without the music or lyrics. Interestingly enough, research has shown musical interaction within a group increases empathy further. In the case of musical interaction, imagine a small group of people who struggle socially brought together over their narrow interest in music and required to problem-solve in order to create a band. Consequently, their social skills improve as they are interacting over their primary interest - music. They may even develop a pseudo-love for their fellow bandmates in proportion to the capabilities of those bandmates to embody their true love (the music itself). Interdependency is necessary and friendship results. Does This Remind You of Anything You Have Observed in Blogging Communities? While I’m not entirely sure what to think of this phenomenon (and it’s a little robotic to think of relationships this way), I have certainly seen the above situation permeate my musical experiences. At one time, I found it difficult to find friendships outside the realm of my narrow interests (until I studied my experiences more through the lens of systemizing and realized what was going on). In order to have a satisfactory social life, I made the effort to be a little more open-minded when a neighbor or acquaintance was interested in something different than me (like playing sports). Beyond the enjoyment aspect, I found diverse experiences socializing are worth the effort for the sake of creativity. Research proves having a variety of life experiences can lead to more creative approaches. People lead you to those life experiences. In essence, according to the article, music acts as an effective medium for those with social struggles who wish to communicate emotions, thoughts, ideas, and experiences. The authors concluded this theoretical study arguing that more research should take place to gain a better understanding of how music-related phenomena can guide social understandings, increase reflection, and increase empathetic functioning. WHERE'S THE CONNECTION TO BUDGETING? Thanks for being patient. Research has found listening to music can increase empathy in a wide variety of people, especially those high in systemizing. As a result, it’s worth asking if people naturally drawn to numbers and money go through a similar experience when reporting their financial stories through the act of writing. Are you going through a similar experience as the above-mentioned obsessive musicians? Are you benefiting socially and emotionally from the process of indulging in your systemizing and interacting with other systemizers online? 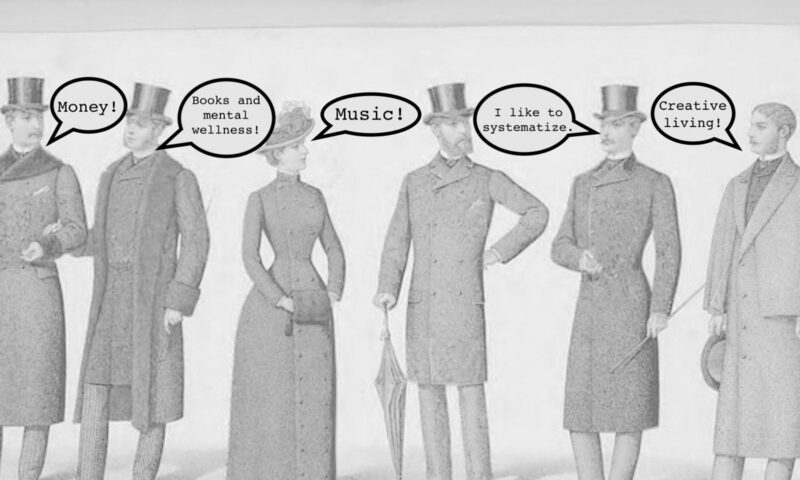 If you are interested, I would like to research the empathizing and systemizing quotients of FI bloggers (and their musical preferences just for fun) through an interview series. You can learn more about my study and find a way to participate at the bottom of this article. Let me know what you think! Will there be a correlation between our musical preferences? Previous PostPrevious Money On the Brain: What Drives You to Systemize?